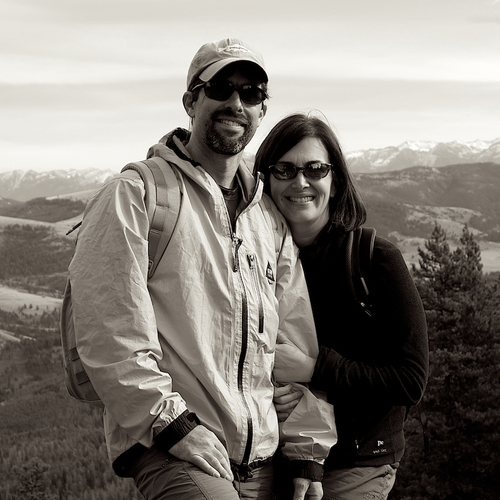 Ryan and Stephanie on Chestnut Mountain, Gallatin National Forest, Montana. November 2012. Taking a half day off of “work” to hike, and instead work on being best friends. I was originally going to write this as a letter to my Ultralight Life subscribers but the advice is too valuable to keep private. Stephanie and I don’t have a perfect marriage but we have a marriage that people notice, and ask questions about because they like what they see enough to overlook our blemishes. I’ve thought about this a lot: what one piece of advice could I tell people to improve their marriage? There’s the usual things you read in the supermarket magazines: take out the trash, do the dishes, keep the gas tank in her car full, cook dinner, protect her, stay fit, comb your hair, write mushy cards, etc. etc. These are all good things and yeah, you need to do them, pal. But my answer to the questions always comes back to the fact that we’re best friends. I’m not a marriage counselor and I’m not a touchy feely sort of guy. I’m an INTJ, an engineer, and an intensely practical man. If you ask me what the secret to a good marriage is, I’m more likely to write down a mathematical formula (yes, I do have one, if you are interested) than to give you some flowery description of love under the Big Blue Sky of Montana in a mountain meadow with snowy peaks framing the scene and chirping birds etc. But I’m no dummy either. You want marriage advice, then I’ll distill it for you, and keep it simple. Make sure you share this with your spouse, because if both of you don’t agree to it, then you’re short selling the potential of what your marriage could be. OK, ready? This won’t cost you a dime. Make serious sacrifices (time, mainly) to do what you have to do to invest into a best friend relationship with your spouse. Be best friends, and realize that your second best friend should be way down in second place. Is your best friend not your spouse? That’s a problem. It’s not the whole story, but it’s a simple recipe that can take you a long ways. What are you doing to invest into a best friend relationship with your spouse today? What are you giving up to do it?